Selected Villas for rent near Koko’s On the Beach (Sri Lanka) - Contact us now! Fancy the thought of feasting on tasty burgers, hand-cut chips and meaty kebabs? If you do, be sure to make a stop by Koko’s On The Beach. 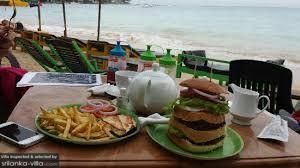 The eatery, managed by its genial and conversational owners, boasts a friendly and easy-going vibe, making it a great place to visit for a casual and enjoyable meal along the charming beach of Unawatuna.